Iran, which has yet to exhibit any hostile intentions toward Warsaw, and in fact does not even possess the sort of missiles the new system is designed to intercept. Putin’s pained response  “We are being told the anti-missile defense system is targeted against something that does not exist. Doesn’t it seem funny to you, to say the least?”  showed signs of the sort of exasperation that reached a crescendo last week with the Russian counterstrike against Georgia’s invasion of South Ossetia. Since Bill Clinton invaded the Balkans and severed Kosovo from the Yugoslav torso, the incredibly patient Russians had stoically endured years of abuse, insults, and increasingly open belligerence directed at the Kremlin. Yet still they tried to have normal relations with the West. The turning point was reached only recently, as the Americans defended the Georgian invasion of South Ossetia and implicitly justified the murder of a dozen Russian soldiers, who were on a UN-sanctioned peacekeeping mission. "Two weeks later they still have not been found. The question is, where is Saddam Hussein? Where are those weapons of mass destruction, if they were ever in existence? Is Saddam Hussein in a bunker sitting on cases containing weapons of mass destruction, preparing to blow the whole place up?" The Times of London described Blair as standing there "grim-faced." What a lovely sight it must have been! That alone, given the British temperament, is reason never to forgive the Russian leader, but Western animus directed at Putin predates the Iraq war, and is rooted in the Russian leader’s personal character. Putin’s predecessor, Boris Yeltsin, gave the West an easy time of it. Continuously drunk throughout most of his reign, the formerly minor Communist apparatchik plunged his crisis-stricken nation  still reeling from the impact of the Communist implosion  into a crash program of what might be called Bizarro economics, with predictable results. Bizarro World, as you’ll recall, is an alternate universe where all natural laws are inverted and common sense is turned on its head: up is down, right is left, and the winners of auctions are the lowest bidders, not  as in our world  the highest. This last example applies directly to what occurred under Yeltsin’s regime, at his direction: "auctions" of property formerly owned by the government and/or the Communist Party were won by those with the most political influence at the court of Czar Boris, not necessarily those who bid highest. Yeltsin sold off the assets of the nation cheap, often to the lowest bidder; even more often there was only one bidder. This is how control of the national assets passed from the old Communist Party to the children of the old Communist Party elite, who were now "businessmen," albeit a lot closer in type to Al Capone than to Bill Gates. Having seized control of much of the nation’s industry  the oil sector, the banks, the electrical grid, the trade in aluminum, precious metals, and big item manufactured goods, like cars  these "oligarchs," as they came to be called, became powers unto themselves. Setting up their own regional and industry-wide fiefdoms, they allied themselves with various criminal gangs, thus acquiring an army of enforcers. As Yeltsin stumbled about in a stupor, this union of the oligarchs with the Russian Mafia established a center of power that quickly came to rival the Kremlin. The country was sinking into chaos when Yeltsin finally succumbed to the ravages of his vices. Before he bowed out, however, he had one more moment of glory. 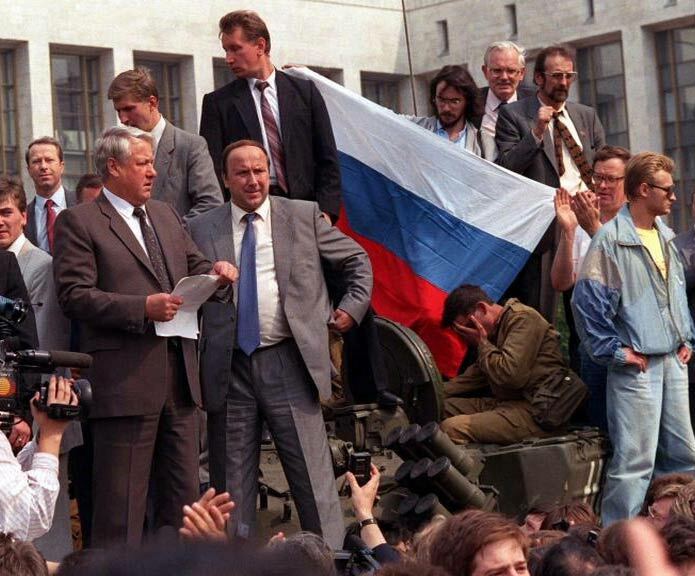 Yeltsin’s first such moment marked the takeoff of his career as a politician, when he stood on the barricades in front of the Russian parliament and declared that the Soviet coup-plotters  who sought the overthrow of Soviet reformer Mikhail Gorbachev  would not pass. This gesture propelled him into the presidency after Gorbachev’s exit, forever after imbuing a weak leader  who presided over the most precipitous national decline seen since the sudden demise of the Aztecs  with an aura of patriotic heroism. The end of his career, too, was punctuated by Yeltsin rising to the occasion, and, in a moment of clear-eyed sobriety, actually serving the interests of his country, by designating Putin as his heir. Perhaps it was Yeltsin’s way of confessing and atoning for his crimes, because Putin immediately moved against the oligarchs, and this was his first great sin in Western eyes, the beginning of the long campaign to defame him as Stalin reborn. This, of course, is what those who want to keep Russia weak and properly compliant would say about any strong leader in the Kremlin. Yeltsin, surrounded by a host of American advisers and in a state of constant inebriation, was a pushover. Putin is anything but, and therein lies the real source of the bile directed at him by Western governments and their attendant elites, especially in the U.S. and Britain. The oligarchs found themselves hated in Russia as much as they were valorized in the Western press. With huge bank deposits overseas, where they stowed away most of their ill-gotten wealth, they fled Russia a few steps ahead of the law as their various acts of embezzlement, intimidation, and even murder were uncovered and prosecuted. Upon their arrival in the West  many fled to Britain, where they quickly gave sagging real estate values a big shot in the arm  they were hailed as brave political "dissidents" in the tradition of Solzhenitsyn and Sakharov. For the past decade or so they’ve been agitating for regime-change in Moscow, to which they dream of returning in triumph, regaining their "rightful" place at the pinnacle of power. The revival of the cold war is proving very useful to this crowd, which is behind much of the anti-Russian propaganda that has filled the airwaves for the past few years. Economic factors also play a major role. The sudden resurgence of Russia on account of its status as a major oil producer has got the Americans and the Brits in a real lather, as their economies respectively plummet into the depths of what some are calling another Great Depression. Russia’s prosperity sticks in their collective craw, and, in response, the Russophobes have developed an entirely novel theory of political economy, which is an outgrowth of the environmentalist fad and the extreme nationalism of our ruling elites. It is the absurd idea that any and all countries that depend on oil to generate the bulk of their national income are unnatural, inherently flawed, and even intrinsically aggressive and a threat to the security of the West. Oil-producing states are inclined, by their very nature, to authoritarianism, they argue, although somehow I don’t think they mean the state of Texas. The Bizarro World "logic" of this new economic fallacy is based on the concept that oil is, somehow, not a commodity like any other, that it has some special status over and above all others, and yet this is clearly not the case. Oil  like wheat, cow’s bellies, and platinum  is subject to market forces and is unevenly distributed geographically. The economic arrangements that go into the production, distribution, and sale of oil are not fundamentally different from those related to any other commodity, from bananas to high-grade steel. The U.S. has been a major oil producer, at least in the past, and that didn’t distort or retard our economic and political development: quite the contrary, it fueled a new era of industrial and intellectual innovation, freeing the individual from the land and inaugurating a new era of political and economic liberalism. Yet now we are told that oil is a curse that empowers tyrants, who can’t be entrusted with such a precious commodity in any event. This is what is behind much of the buzz against Putin’s Russia, flush with oil revenues, and the real source of friction between the Kremlin and the West. It is pure nonsense, economically, but, then again, like most war propaganda, it doesn’t have to make sense; it only has to demonize the enemy from as many different angles as possible. Congruent with this oil-as-the-root-of-illiberalism thesis is the idea that the Russians and the Chinese, along with their clients and allies, constitute a new pole of ideological attraction, in opposition to the liberal democracy of the West. In true Bizarro World style, this gets it completely wrong. Looked at in terms of the last hundred years, or so, it is Russia  which threw off the yoke of the most oppressive regime in modern times  that is moving in the direction of freedom, and the West  where the surveillance state is a fact of modern life, and that document known as the U.S. Constitution is just a scrap of paper  that is moving toward authoritarian rule. As for China, it has progressed from the Cultural Revolution to the Beijing Olympics in less than the historical blink of an eye. The U.S. and its allies in Eastern Europe and the Caucasus seem determined to provoke the Russian bear into a confrontation, and the crisis over South Ossetia is just the beginning. As I have warned in this space for what seems like an eternity, a new cold war between the U.S. and Russia is a project dear to the War Party’s heart  and it seems to have come to full fruition in the past week or so. The War Party never sleeps  they’ve always got a new angle up their sleeves, a new "Hitler" who must be crushed in the name of democracy and decency, and against whom all the resources of the West must be mobilized  until a new enemy is found. The latest such enemy is Putin’s Russia, specifically, Putin himself, who is now being characterized as a hybrid monster, an authoritarian admixture of Hitler and Stalin. Aside from an upsurge in the profits reaped by the makers of armaments, the revival of the cold war also means that the Kremlinologists of old will be back in fashion in Washington  and that all those doctoral dissertations on the history of the Czechoslovakian Communist Party were not written in vain. The cold war wasn’t just an era, it was also an entire industry, consisting of high-level policy wonks, professional anti-Communists and domestic subversive-hunters, as well as the military-industrial complex, which generously subsidized the activities of the former. This whole network collapsed, along with international communism, back in the 1990s, but anti-Putinism will bring it back to life, thus providing employment for a certain narrow segment of the population, even if the rest of us are selling pencils in the streets. "What is troubling is the U.S. media’s willingness to similarly toe the party line, but in the absence of any of the coercive measures, such as the state censorship, that the Russian press endures. There have been no William Dunbars on CNN, despite the fact that every report I’ve seen on the channel yesterday had been framed as ‘Russian invasion,’ with endless clips of Saakashvili alleging Russian crimes, etc., in a loop of totally pro-Georgian coverage. Georgia is a key U.S. ally, the 3rd largest troop contingent in Iraq, and occupies a strategic, oil rich zone. The self-policing in the U.S. media, which has basically been uncritically promoting government talking points, is very disturbing. " Go read the whole piece, which is unsigned. It’s about how the Russian and Western media combines reported two entirely different wars, which had very little to do with one another. One explanation is that with Russia moving toward more freedom, in fits and starts, and we in the West moving toward much less, we’re converging somewhere in midstream. Indeed, one could make the case that the Americans and their British counterparts are too well-trained to go off-message, while in Russia they still have to be constrained by formal rules and regulations. Official censorship simply isn’t necessary in the West, because everyone knows what to say  and, more importantly, what not to say. Yes, it’s disturbing, but at least from my vantage point, not all that surprising. Ever since 9/11, and even predating that signal event, we’ve been headed in this direction, with the media (in alliance with demagogic politicians) policing not only itself but the entire society to make sure no pockets of dissent exist. Which brings me back, as has been the case for the past week or so, to the subject of Antiwar.com’s survival. Yes, we’re in the midst of our end-of-summer fundraising campaign, and we’re having a rough time of it. I’m not surprised. Times are bad economically, for most of us, and charitable contributions are down across the board. Which is all the more reason why it’s so important that you make your contribution, and make it today: our creditors are knocking on the door, and the challenges we face, in this new era of a revived cold war, are all the more onerous. The prospects for peace look darker than ever, a fact that only underscores the importance of our work and the continuity of this Web site. We provide an alternative voice in a time when the conventional wisdom, which is invariably conducive to the War Party’s agenda, is not just factually wrong, but actively dangerous. Our task of educating the American people about foreign policy issues from a non-interventionist perspective has never been more vital  nor more endangered by our lack of resources. We are fighting an uphill battle. Won’t you help us even the playing field, just a little bit? The War Party has unlimited resources. We have you. We depend on your tax-deductible donations to keep this site going, so we can keep bringing the truth about American foreign policy to the people. It’s essential that we make our fundraising goal of $70,000 this quarter. If we don’t, huge cutbacks in our coverage will be required. It’s as simple as that. Your contribution makes all the difference, so make it today.